Uncategorized | The Killer Robots! Orlando Nerdfest Approaches! You can see us at the Orlando Science Center on Sunday August 9th at 5 pm! Also, our first movie, The Killer Robots and the Battle for the Cosmic Potato will be screening that Sunday evening at 8 pm. The entire festival runs from Friday August 7th to Monday August 10th, so come check out some awesome bands and performers! Order Tickets Here! In other news, Strobo and Auto ventured onto the Oh No Radio Show July 17th. You can check the podcast out here: leakedfrequency.podbean.com. Thanks to Owen, Ty and Tom for having us on. We enjoyed talking about the band and movie and listening in on their commentary of obscure and surreal current events. 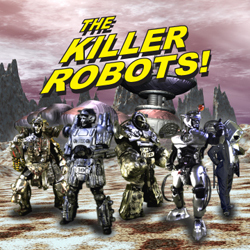 And now, The Killer Robots! Crash and Burn movie news! All two thousand shots have been filmed, keyed, layered and graded. Killer Robots headquarters is littered with the remnants of hundreds of silver and black puppets, models and costumes. All that remains is a bit of tightening, pick-up shots, music, rocket butts, voice overs, and sound effects. Stay tuned!